Flying has changed a lot in its 100-year history, from entertainment-free and pricey flights to double-decker aircraft with wi-fi connections. And now Dubai is planning to also radically advance the entire experience before boarding the plane, from travelling to the airport to checking in luggage and passing through security and immigration. “So we envisage at some stage in the future a Downtown terminal — or indeed, a number of stations — where you can just drive up or get the metro, drop your bags off, check in, get on a train and then be whizzed straight to the airport in great comfort and be as close to the plane as we can get you. The superior journey is being integrated into the masterplan for Dubai’s second airport, Al Maktoum International at Dubai World Central (DWC), which is partially open. It will link into existing public transport networks, with an extension to the Dubai Metro Red Line, upgrades to Sheikh Mohammed Bin Zayed Road and Emirates Road and, eventually, a national rail line. Dubai Airports, which also operates Dubai International, has already sped up the throughput at security by four times just by introducing machines that automatically return the trays used to carry passengers’ belongings through the x-ray machines. At immigration, citizens of 26 countries can now breeze through electronic gates with a pre-approved e-card that costs AED200 ($55) and is valid for 2 years. The US ambassador to the UAE also revealed recently American customs pre-clearance, which has been successful at Abu Dhabi International Airport, could soon be extended to Dubai. But Griffiths has an even more Jetsons-style vision for the future. “The technology exists to make the passenger experience in an airport significantly better than it currently is but the difficulty we have is getting the new technology adopted by the authorities. “The whole screening process for security could be a lot slicker and a lot less intrusive than it is. We’re looking at ways of providing exactly the same — or in fact an enhanced — level of assurance that people aren’t carrying any prohibited items, but we’re looking at ways to make that scan non-intrusive. I can’t think of another process in any customer service delivery chain that is more inconvenient or intrusive than airport security, and I don’t think that’s right. I don’t think our customers deserve to be treated the way they do. But it’s not only technology that will enhance the airport experience. Paul Griffiths is acutely aware of the need to improve Dubai’s welcoming mat — immigration. Even the simple gesture of an Arabic date upon arrival is being considered. “Singapore is perfect. You arrive, you walk up to the desk, there’s always enough desks open, people are smiling, the first thing they say is ‘welcome to Singapore, I’ll be as quick as I can, this will just take a minute or two, would you like a sweet while you’re waiting’. That’s just great because it makes you feel, ‘wow this is a great place’ and your first impression is so consistently positive. While Al Maktoum International could revamp the entire aviation experience, the airports boss is keen to pilot the new ideas at Dubai International. Al Maktoum International is already making waves in the international aviation industry with plans for it to be the world’s largest airport when it is fully operational, likely to be by the end of the next decade. Passenger services started in October and 6 airlines, from regional leader Qatar Airways to Hungarian low-cost carrier Wizz Air, have permanently begun servicing the facility or have added new services that are offered on top of existing flights to Dubai International. 12 other airlines have also moved all or part of their operations to Al Maktoum International while runway upgrades are carried out at the main airport between 1st May and 20th July. Griffiths is hopeful some of them will remain there, while it is inevitable that more and more carriers will be forced to the new airport as capacity, especially during peak times, dries up. “We’re pretty much at capacity now because the availability of peak slots is very limited. And the number of movements that we’re able to get declared in the system is incremental, capacity is very small so airlines, especially new entrants that are looking at Dubai for the first time, either have the option of coming into Dubai International at times which might not be their preferred times or to go to DWC and operate at the times they want. There are no forecasts for passenger growth at DWC due to the spike caused by Dubai International’s runway closure and the uncertainty around which airlines will remain at the new facility. But one airline unlikely to make the move in the near future is Saudi low-cost carrier flynas. It had declared it would be one of the very first airlines there but CEO Raja Azmi cancelled because there were insufficient incentives, which would have made operating at the second airport more expensive than Dubai International. His Saudi customers would not be satisfied with the quality of duty free shopping and lounges at DWC, forcing him to cut fares to attract them, he said. “My retort to that is that there are 18 carriers with whom we’ve successfully negotiated commercial terms that they’ve found perfectly acceptable,” Griffiths says. “Flynas were offered similarly competitive terms and declined not to operate, so I don’t believe that it’s down to the airport… this is probably a proxy for other things that are going on with that airline. Meanwhile, Dubai International has become effectively the busiest international airport in the world, having taken over from London’s Heathrow during the first four months of the year, with more than 6 million passengers per month during February-April. April’s figure of 6.16 million passengers was 13% higher than a year earlier. But Griffiths isn’t shouting from the rooftops just yet. Overtaking Heathrow has been helped by the British government’s inability to decide how, or even whether to expand the country’s main airport. It is running at capacity, while political infighting, a factor that is, of course, wholly absent in Dubai, has prevented any movement on a resolution. Griffiths, a Brit who used to run the UK’s second-largest airport at Gatwick, says it is a “shame” political parties have ignored the potential a new Heathrow runway could have for “prosperity”, connectivity and the tourism economy. “Heathrow Airport released some figures saying that it would create tens of thousands of jobs and about £100bn of contribution to the UK economy, you can’t turn your back on those numbers,” Griffiths says. Other countries are also stifling their own aviation potential by restricting landing rights, usually to protect national carriers. UAE airlines have been fighting for greater access to markets such as Canada and India. Griffiths says the policy of protecting jobs and the bottom-line prospects of a single airline damages the economy as a whole. Government-owned Dubai Airports reveals only a few indicative financial figures each year. 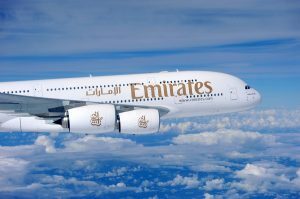 It says for 2013, total revenue grew 17%, including a 12% rise in aeronautical revenue, thanks to the continuous strengthening of Emirates and flydubai, which are also government-owned. Commercial revenue from retail sales, advertising and asset management improved a significant 23% and now accounts for more than half of the company’s overall revenues. The aviation sector contributed $22bn, or 28% of gross domestic product, to the Dubai economy last year. International competitors complain the Dubai airlines receive unfair concessions and are funnelled with government cash that allows them to operate with a commercial advantage. But Griffiths is adamant the industry is commercially sustainable. It’s doing so well that Griffiths says he’s undeterred by the opening of Hamad International Airport in Doha in May, or plans for massive expansion in Saudi Arabia, as well as construction beginning on Istanbul’s third airport, which the Turkish government claims will overtake Al Maktoum International as the largest when it opens. Griffiths says on face value it appears that aviation capacity in the region is out of kilter with the population, but that’s where such analysis would be too simplistic. “The reality of the situation is that the Middle East is in the absolute perfect location to be the intercontinental hub for the world and there are so many cities that can be logically joined through the Middle East,” he says. But there is one issue that threatens to bust the aviation growth story for Dubai, and its neighbours, air traffic management or the lack thereof. With so many more planes flying in such a small region, there will come a time when air space is the barrier to growth, not airports or money. While Griffiths says the persistent problem is the sector’s “single largest strategic risk”, he’s happy it lies in the hands of state leaders. Meanwhile, he can play with the more fun projects, like creating the airport of the future.